The news that the Reverend Ian Paisley, the founder of the hardline Democratic Unionist Party and several associated paramilitary groupings, was reportedly seeking arms from Israel in the mid-1980s, has failed to stir up much controversy, perhaps reflecting the clergyman’s expected militant reputation. The claim came in a thirty-year old Department of Foreign Affairs document, code 2017/4/78, part of a collection of formerly secret files now open for inspection in the National Archives of Ireland. In June 1985 Noel Dorr, Dublin’s ambassador to the London, dispatched a letter back home detailing a conversation with his Israeli opposite number, Yahuda Avner, during a recent diplomatic gathering. According to Israel’s representative, the DUP leader had sought his country’s help to purchase “border protection” some months earlier, a reference taken by him to mean weapons. 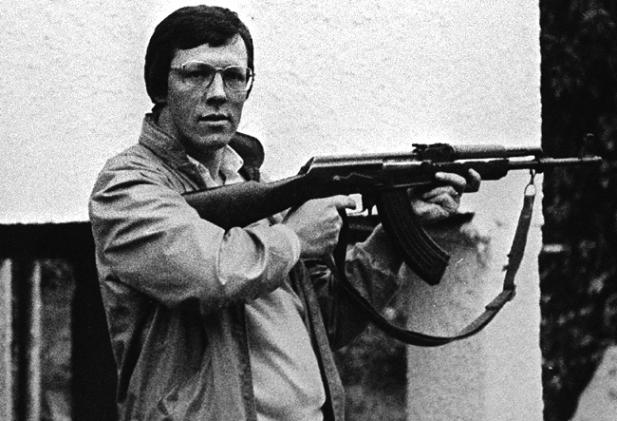 “He said that Rev Ian Paisley had been in touch with him to obtain arms. I expressed surprise at this since I thought it unlikely that Paisley would leave himself open on something like this. The Ambassador said that the request related to “border protection”. Some apologists for the Democratic Unionists have sought to dismiss the decades’ old claim as diplomatic scuttlebutt. Unfortunately for Paisley’s defenders, we know that in late 1987 the DUP’s shadowy terrorist wing, the Ulster Resistance (UR), did receive crates of weapons and ammunition from Israel; albeit via the Whites-only regime in South Africa. In December of that year, a consignment of assault rifles, rocket-launchers and thousands of bullets, originally captured by the Israelis from Palestinian guerrillas in the Lebanon, was supplied to British militant factions in the UK-administered north-east of Ireland by the apartheid government in Pretoria. As well as Paisley’s UR, these factions included the Ulster Volunteer Force (UVF), the Ulster Defence Association (UDA) and the Red Hand Commando (RHC). What united these otherwise frequently disparate gangs was their fanatical opposition to the Anglo-Irish Agreement of 1985. That treaty saw the Conservative Party government of Margaret Thatcher in London grant Dublin considerable input into the administration of the Six Counties. A “surrender” which outraged the unionist minority in the disputed region, soon joined by conspiratorial elements of the Royal Ulster Constabulary (RUC), the local paramilitary police force, and Britain’s Security Service; better known as MI5. So, Ian Paisley’s request for weapons from Israel sits logically with the DUP’s known arms smuggling activities in the mid-1980s, via its terror wing, the Ulster Resistance. Smuggling which ultimately led back to the state of Israel through the Republic of South Africa. Did you know at one point the Ulster Workers Council were courted by Gadaffi? He thought “worker” in the title meant they wanted to overthrow the west. Invited to Libya they bump into top PIRA at an hotel. Quite a fight one heard. Indeed, which was a bit of a shock for republicans. The UWC Strike fooled him into thinking that the unionists were the revolutionary community. Didn’t last long though. Il ha’am du’l il eh. Take note, diss the “RA get sodomised with a bayonet 30 years later.